A long since discontinued pizza from a certain classy national supermarket was at one time a favourite of mine, and once my pizza dough making had settled in to its groove I began experimenting with suspected ingredients drawn from a hazy memory, and the results felt satisfyingly familiar. I had before turned the onions almost in to a relish, but realised the other flavours were drowned out by the intense sweetness. The rest of the pizza was rendered almost pointless, so I urge you to hold back on the sugar. It’s a subtle luxuriant pizza, perhaps a little rich, and therefore best when you are not dining alone and can prepare other contrasting pizza types to compliment it. Use my pizza base recipe, and allow around two hours for it to rise. Remember, if you’re comfortable with handling dough, use a 3:2 flour to water ratio and just be ready with the bag of flour to keep dusting your hands and the kneading surface to prevent sticking whilst kneading. You’ll also no longer need a rolling pin for your dough, and instead should be able to stretch it out by hand. Once your other parts of the pizza are underway, part-cook the base until it’s just firm enough to quickly apply the other ingredients to before returning to the oven. Onions begin to caramelise once the water has been cooked out of them, this can take some time and it can be a challenge to avoid burning. If you want best results all your pieces of onion need to be relatively the same size and thickness to cook evenly and they need to be monitored. Stir them occasionally, cooking on a low temperature for up to 45 minutes. Adding water obviously counteracts the process, but I find a drop useful if they’re looking a little close to burning. If you’d rather not cook onions for that length of time (and I usually don’t), they’ll still be suitable and will have a nice bit of bite to them after just ten minutes cooking. I quite like cutting a range of sizes too which goes against the suggested caramelisation method, and sugar will be added to boost the sweetness anyway. Once the onions are cooked, add the vinegar, salt and sugar, stir and simmer until the liquid has almost gone. 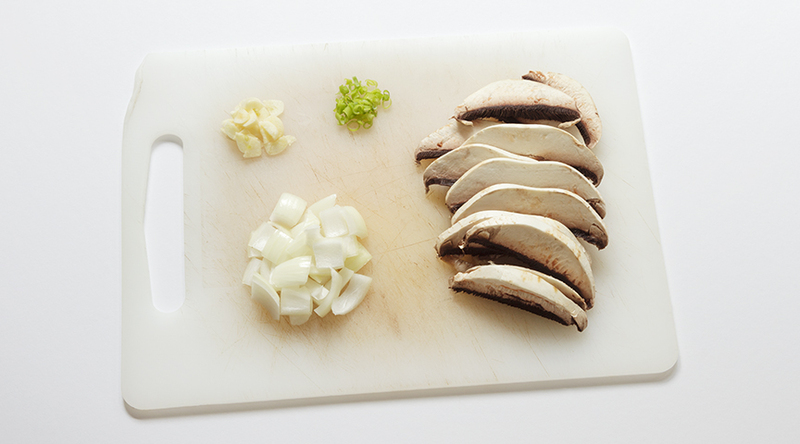 Cut long thin pieces of mushroom and cook them in a little butter or oil. 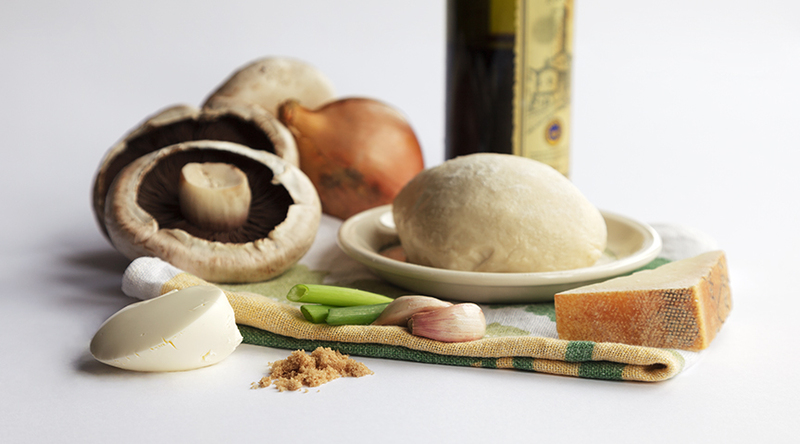 Putting raw mushrooms on a pizza will result in them resembling dried up slugs, but cooking beforehand will saturate them in their own moisture and protect them from the heat of the oven. Briefly warm the mascarpone to soften it, season and stir in some oregano. 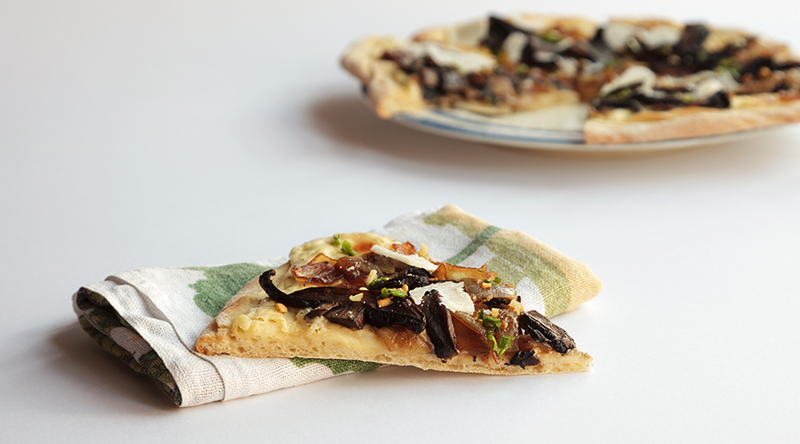 Apply to the part-cooked pizza base and partially stir the onions in to the mascarpone, avoiding too much uniformity. Add the mushrooms and return to the oven. Garnish the finished pizza with fried spring onion, garlic and parmesan. Cook the pizza dough for 5-8 minutes 200-250c. Remove. Warmed ’til soupy. Spread on to semi-cooked base. Partially stir in onions and top with mushrooms. Return to oven for another 5-8 minutes. Fry and add to the finished pizza. Add parmesan shavings. This entry was tagged Balsamic vinegar, Brown sugar, Caramelise, Caramelised, Caramelised onions, Creamy, Dough, Field mushrooms, Garlic, Italian, Mascarpone, Muscavado, Mushroom, Mushrooms, No tomato, Onion, Onions, Oregano, Parmesan, Pizza, Pizza dough, Rich, Salt, Spring onion, Sugar, Yeast. Bookmark the permalink.